Lennar Traffic Impact Study – Yamabe & Horn Engineering, Inc.
Yamabe & Horn has a longstanding relationship with the Central Valley division of the national home builder, Lennar, having worked on many of their projects over the past decade. Lennar recently acquired 15 acres in Fresno on the northwest corner of Armstrong and Dakota and began developing it into a 93 lot residential development. As part of any development, a traffic impact study must be completed to determine the effect of the new construction on the roads and intersections that lead to it. Yamabe & Horn was brought in to complete this study and help Lennar determine their responsibility for improving the nearby roads and intersections. The typical residential traffic impact study covers the four main intersections within a one-half mile radius of the development to determine their adequacy to handle the new increase in daily traffic volume from the new residents. For this development, three of the four intersections were more than adequate to handle the increase in traffic that was calculated. 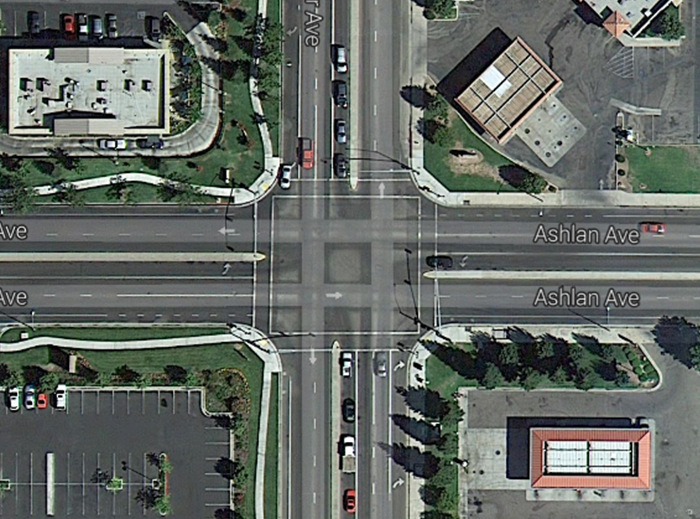 The fourth intersection, located at Ashlan and Fowler proved to be inadequate, specifically at the left turn lane for southbound Fowler. Once the future bottleneck was identified, Yamabe & Horn pulled GIS maps for the intersection to determine which frontage was the best to absorb to create the extra turn lane. There is a gas station to the east and Starbucks to the west, making the choice obvious to absorb the frontage on the west since the gas station has underground tanks and essentially zero frontage space to absorb.